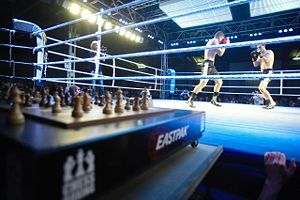 ^ World Chess Boxing Organization’s chess boxing 互联网档案馆的存檔，存档日期2010-04-02. ^ World Chess Boxing Organization’s Q&A 互联网档案馆的存檔，存档日期2010-04-03. ^ Kirsan Ilyumzhinov As A Chess Boxer! ^ Nikolay Sazhin is the New World Champion 互联网档案馆的存檔，存档日期2010-12-24. ^ Youngest Chessboxing Champion Ever 互联网档案馆的存檔，存档日期2010-04-11.